Laure Genillard proudly presents the first major British exhibition of post-war German artist and poet, Werner Schreib together with a new sound piece by artist-composer Annea Lockwood. AFTERSHOCK will feature Schreib’s fragile and distinctive works on paper created through his method of semi-mechanical reproduction employing frottage, collage, fumage and brûlage, together with his concrete and visual poetry. Although World War Two officially ended in 1945, the process of unravelling the legacy of that war continues to this day, with repercussions and resonances that, like the aftershocks of an Earthquake, reverberate indiscriminately and uncontrollably, sometimes producing effects deeper and more devastating than the earthquake itself. The full extent of the atrocities committed in that war and their implications still remain shrouded in a veil of mass silence. Despite the lessons of World War Two, the technologies of death and genocide that foster ‘terminal culture’ spiral out of control. The exhibition AFTERSHOCK, The Grammar of Silence finds itself situated within this urgent context, presenting the work of two artists whose work represents a response to ‘terminal culture’ and a breaking of the silence in which terminal culture incubates and reproduces itself. 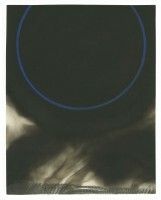 Werner Schreib was an important rising star in the post-war German art scene. He is best known to London audiences for his participation in the 1966 Destruction in Arts Symposium where he created several notorious pyrotechnic performances condemning the Allied involvement in the Vietnam War. His practice was outward-looking, collaborative and prolific, spanning painting, printmaking, performance, poetry and public sculpture, but his contributions were prematurely cut short when he died suddenly in a fatal collision with a jack-knifed lorry on the autobahn at the age of 44. Orphaned at the age of eight, Schreib was forced to attend the Napola (the Nationalpolitische Erziehungsanstalt), elite boarding schools indoctrinating youth in Nazi ideology with the mandate of creating future Nazi leaders – their motto – ‘Education for Nazis, proficient in body and soul to the service of people and the state’. After studying science and engineering at university for one term, the young Schreib felt the need to serve his country. He volunteered for service and was appointed Lieutenant in the German army at the age of 17, serving alongside the naval fleet with the Minesweeping and Safeguarding unit, very nearly drowning when his ship was gunned down in the Baltic Sea in 1945. He began to draw and paint while in British captivity and on his release in 1947, he began his studies in painting and graphic art at the Muthesius-Werkschule für Handwerk und angewandte Kunst and then later at the Wiesbaden Werkkunstschule. Schreib was deeply affected by the conflict between his Nazi schooling and the horrors he experienced in the war, the destruction visited upon Germany and the truth about the so called ‘Jewish solution’. 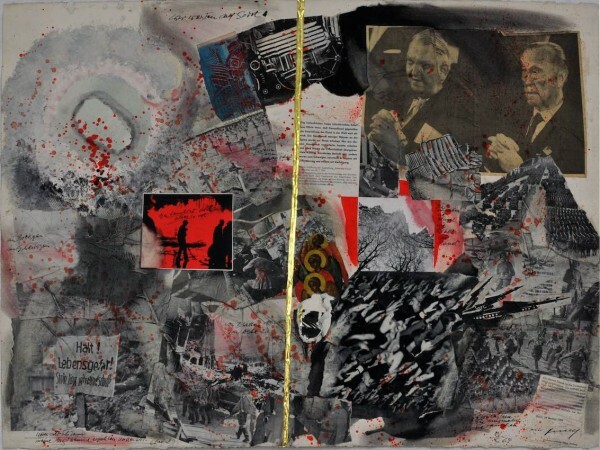 Throughout the remaining 22 years of his life, he actively engaged in re-examination and critique of these experiences and of the logic of destruction through both his art and poetry and his collaborations with artists internationally. 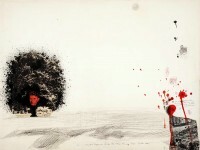 One of the earliest instigators of happenings in Germany, Schreib began his performance work in the early 1950s, while his paintings and poetry were exhibited in the 1958 Documenta. He was deeply influenced by the poetry and art of Kurt Schwitters and he developed a lasting friendship with Max Ernst whom he first met in Paris. Together with the Italian painter Luciano Lattanzi, he authored the Manifesto on Semantic Painting in 1960. Though not without controversy, his work was highly respected by his peers and received much attention in the form of television interviews, awards and exhibitions. 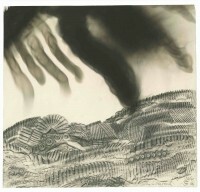 AFTERSHOCK features Werner Schreib’s uniquely crafted and fragile works on paper which he began to create in the 1960s. These works draw on his theories of semi-mechanical reproduction and combine found objects in the form of relics of a technical world deprived of their function (‘Relikte der technischen Welt, die durch ihre Abnutzung Funktion verloren haben’) with the techniques of frottage, collage, fumage and brûlage to describe the catastrophic events of the Second World War and the death-wish dialectic between technology and destruction. Schreib’s work combines Surrealist and Dada aesthetics with the sophisticated manipulations of a destructive art practice. The artist employs the very means of destruction to create works that engage in a discussion of terminal culture and its potential to bring about the end of civilisation. Annea Lockwood’s installation, DUSK, is an environmental sound work concerning the hidden and inaudible sonic phenomena generated through underground explosions from seabed ‘black smoker’ hydrothermal vents normally only accessible by seismologists. Lockwood has transposed these frequencies to the audible range focusing a listening experience on that which may not otherwise be heard and creating a work that gives us a glimpse into the hidden voice of the planet we call Earth. - Andy Horwitz, ‘A Trip Through the Garden of Sonic Delights’, Culture Bot Maximum Performance (8/13/16). Lockwood was active in the 1960s London avant-garde sound-poetry circuit, working with Hugh Davies, Bob Cobbing, Henri Chopin and Gustav Metzger among others, and was also known for her GIass Concerts. Like Werner Schreib, she was a participant in the Destruction in Arts Symposium, creating piano destruction works with Ralph Ortiz. For Lockwood, who has a deep interest in our relationship to the ecology of the planet, the destruction of the piano was as much about the artist’s effort to explore uncharted languages of composition as it was about deconstructing the canon and culture of the piano itself. Lockwood was more interested in organic forms of deconstruction and eventually turned to events involving Piano Burning, Piano Gardens and the other Piano Transplants, in which defunct pianos were burned, drowned, beached, and planted in an English garden, and which all involve the action of slow, natural processes on pianos.